Sort by Description / GPIO number / SODIMM number / Evaluation Board jumper number. 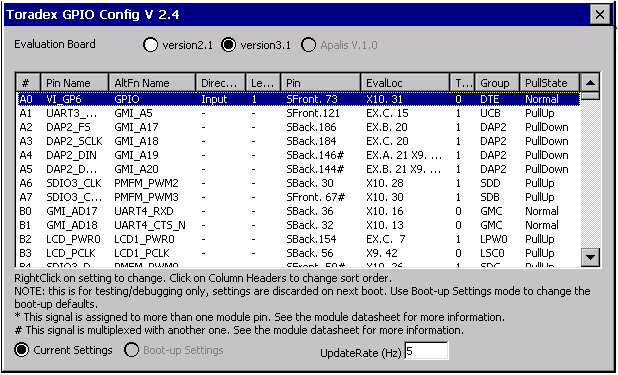 Modify the GPIO boot settings. The version 2.4 of GpioConfig works for Toradex modules based on PXAxxx and Tegra Txx CPUs. Note: For easy maintenance, we have split GPIOConfig tool into a separate GPIO tool for the Vybrid modules. 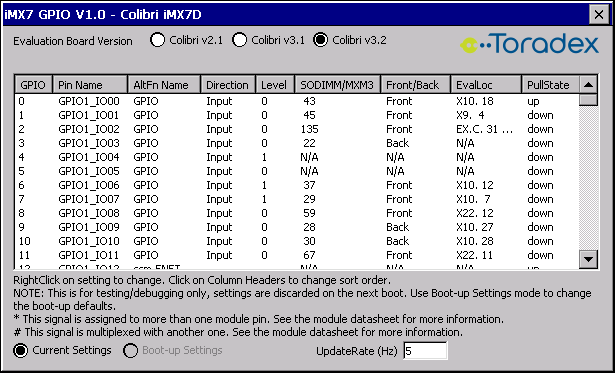 The Vybrid GPIO Tool works on Colibri Vybrid modules with the bootloader / WinCE image V1.1 and later. Fix: Pull-up by 22k and 47k was not working on Vybrid GPIO V1.0. Fixed in V1.1. We have split the former GPIOConfig tool into a separate GPIO tools for each platform. 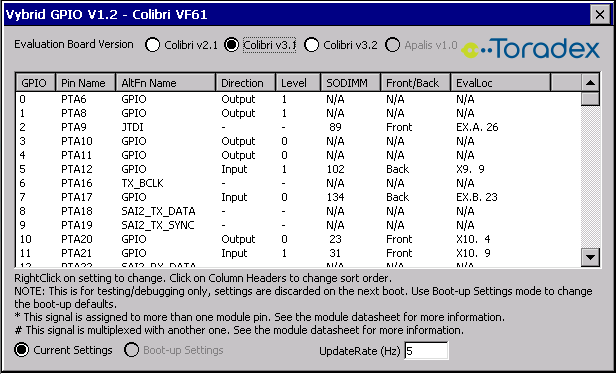 The iMX6 GPIO Tool works on Colibri and Apalis iMX6 modules only with the bootloader / WinCE image V1.0Beta4 and later. UART signal naming: UARTs are used in DTE mode on Colibri and Apalis iMX6 modules. This means the UARTx_RX_DATA port is transmitting data from the SoC while the UARTx_TX_DATA port is receiving it. 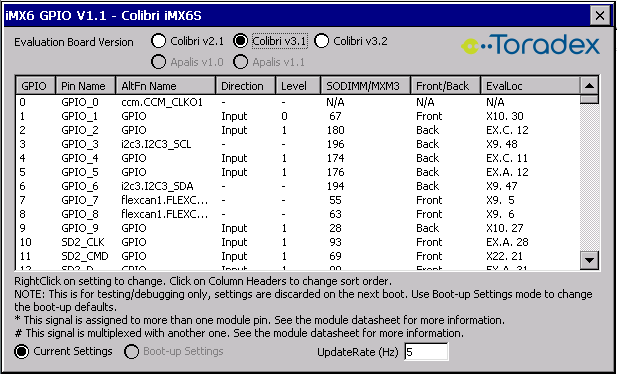 Please also refer to the Apalis iMX6 or Colibri iMX6 datasheet for further details on individual pins.